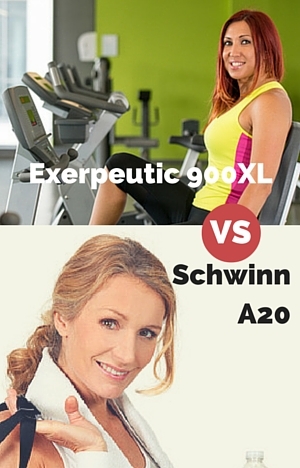 Compare Exerpeutic 900XL vs Schwinn A20 – It’s More Than Just Looks! When comparing the Exerpeutic 900xl vs Schwinn A20 recumbent exercise bikes it can be difficult to determine what the differences really are, especially as the listings don’t tend to have all the information needed to do it. Other than they look different! In this post we’ve brought together the information to show the bikes and differences side by side to help with deciding on whether they justify, the big question, as to why is one priced more than the other. And to help you with choosing between the two. There are a lot of similarities between the two as they are both comfortable and gentle on the joints and a god way to get a low impact cardio workout for the legs. Many people use them for recovering from injury or because of injury (when advised by their doctor) as well as to get in shape and burn calories. Before getting into the differences and side by side comparisons here is a quick overview of the two bikes. This is one of the most popular recumbent exercise bikes available and it is well rated by customers too. It is a basic bike without too many frills other than a console for giving you feed back as you workout. You can adjust the bike to fit a range of people’s heights between 5ft 3 ins and 6 ft 3 ins by adjusting the seat’s horizontal position. It can be used by adults of all ages who want a comfortable and low impact workout. It has magnetic resistance that is controlled by a tension knob just below the console which you turn to adjust the amount you want to push against. It has 8 levels of resistance which is marked on the knob. Customers like the price as well as that it is very quiet and it feels stable and secure as they workout. They can exercise any time they want. Read my full review here. The Schwinn A20 has a simple smart looking design. It is simple to operate too. It comes with a good console for the price that gives you 6 pre-set workout programs for variety and motivation. You can also use it without choosing the programs. It displays progress along with a range of measures to help you stay on track with your workouts. There are hand pulse sensors in the handlebars (as there are with the Exerpeutic 900XL) which can help you monitor your heart rate. Other measures the console keeps track of are speed, distance, RPM, calories burned and resistance level. It can be quickly adjusted to fit a range of heights between 4ft 11 ins and 6 ft 3 ins by moving the seat to the required position. Rather than looking at the similarities (you can see a detailed comparison below) I’m going to focus on the differences as they’ll be the reason why one bike will be better for you than the other and might justify any price difference (or not) for you. Step Through Design. The Exerpeutic 900XL you can step through the bike without really lifting your foot at all to get on to the seat. Whereas the Schwinn A20 you need to lift your foot a few inches to get over the frame. Maximum User Weight. The Exerpeutic 900XL is specified to be able to accommodate someone up to 25 lbs heavier than the Schwinn A20 with a maximum user weight of 300 lbs. Height Ranges. The Schwinn A20 has, based on customer feedback, more scope to be adjusted to fit shorter people by 4 inches by catering people who at 4ft 11 ins up to 6 ft 3 ins. On the Exepeutic 900XL those under the height of 5 ft 3 ins you are likely to have to stretch to reach the pedals and/or sit forward on the seat both of which are uncomfortable and could cause injury. Area. When you want to store it the A20 requires slight more area but they are different lengths and width so storing will depend on the dimension of where you plan to put them as to whether they’ll fit or not. The A20 is 19 by 61 and the 900Xl is 22 by 54. Bike Weight. The Exepeutic is about 2.9 lbs heavier than the Schwinn A20. Levelers The Schwinn A20 back stabilizer’s end caps work as levelers. You turn them and they can help in preventing the bike from rocking when the floor has a little variation in it. The Exerpeutic 900XL does not come with that so need to be on a completely flat surface or need to put on a rubber exercise mat or make other arrangements to prevent rocking on an uneven floor. Power/Resistance. Both consoles can be powered by battery. However, the A20 can also use power adapter but that needs to bought separately. If the batteries are drained on the A20 (and you don’t have the adapter) then you can’t change the resistance or use the programs that automatically change the resistance as you work through it. However, with the 900XL without a working console you can continue to make the adjustment as this is done manually with the tension knob. Without batteries you just don’t get feedback. Seat Adjustment. You do have to get off the bike to adjust the position of the seat on both bikes. However, the A20 is easier as you only have the one adjustment knob to loosen and tighten to do this. The 900XL is more involved with it having 3 knobs they have to undone and done up. It takes a bit more time and it is a bit more fiddly. Display. The A20 provides you with more information than the Exerpeutic. It allows you to monitor progress on the preset programs plus displays the measures of speed, time, distance, RPM, calories, resistance level and heart rate (when sensors are gripped). The 900Xl only displays speed, time, distance, cumulative, calories and heart rate (when sensors are gripped). The resistance level is marked on the tension knob which is used to adjust the resistance. Pre-Set Programs. The A20 comes with 6 pre-set programs that help with providing some variety and guidance with your workouts. You can set how long you ride for on these too. You can also just get on the bike and pedal away adjusting the resistance as you go. Flywheel Weighting. The perimeter weighting of the A20 should result in a smoother pedaling experience than you get on the 900Xl at the higher resistance levels as it will offset some of braking effect of the resistance that starts to slow down the flywheel and pedals making it start to feel like it is pulsing. Accessories. The A20 has a water bottle holder on the front support whereas the 900XL has none. Handlebars. As well as a set by the seat the 900XL has a set on the front support that can help with getting in and out of the seat. The better rated bike of the two is the Exerpeutic 900XL due to Schwinn A20 having 1 or 2 issues with quality control. On that note unless you want the 6 pre-set workouts (which can be a great help with getting started and staying on track) and are over 5 ft 3 ins the Exerpeutic 900XL makes a good choice due to its reliability and price. If you are going to adjust the bike on a regular basis you will need a little patience until you get a hang of making the adjustment. If you do want an affordable recumbent exercise bike that has pre-set programs or you are under 5 ft 3 ins then the A20 is the way to go. Or you could spend another $60 – $70 (when I checked) and get a bike – the Schwinn 230 – that offers 22 pre-set programs while providing a very good comfortable low impact workout. The table below lists the specification, features and dimensions of the Schwinn A20 and Exepeutic 900XL side by side so you can compare them quickly to see how they match up. I hope you now have all the information you wanted to make up your mind as to which is the right bike for you. It would be great to hear what your thinking is on these two recumbent exercise bikes.